We have a variety of transportation options to help our busy families. The Harker School’s four divisions – preschool, lower, middle and upper – are on four distinct campuses. 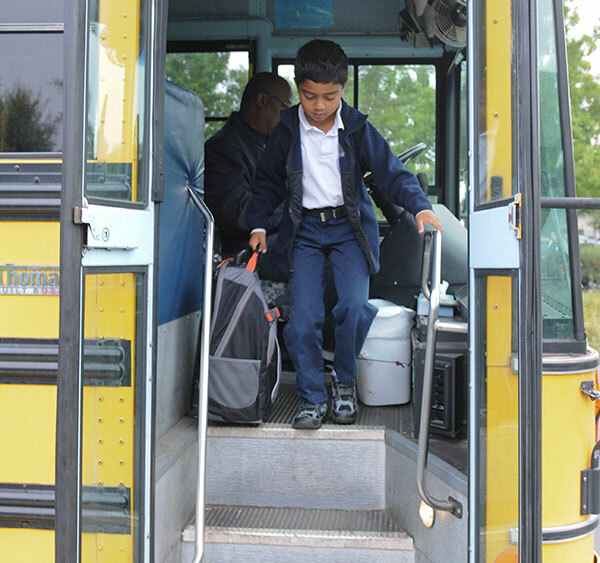 We offer a variety of transportation options for K-12 students to help our busy families around the greater Bay Area. Harker also provides a shuttle to athletic teams for their away games. Our four campuses are connected by a free morning and evening intercampus shuttle. This provides the convenience for our families of dropping off and picking up all of your children at one campus; we’ll drive them to their respective campuses. Students K-12 may ride this shuttle. 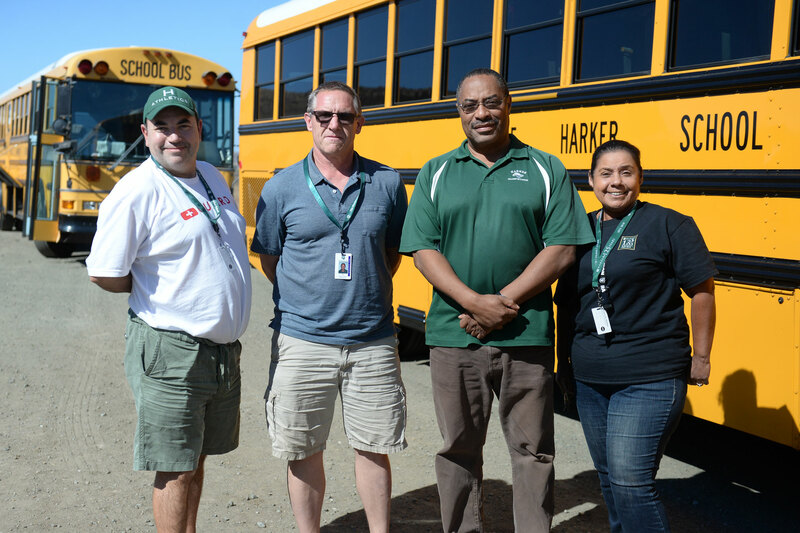 As a service to our families, Harker provides bus service from three locations: the Peninsula, Silver Creek and the Santa Clara Caltrain Station. The service runs Monday through Friday on all dates in which school is in session, with some exceptions that are announced each school year. Fees range from $6.40 to $12.50 per ride and vary depending on the route, a.m. and p.m. service and how many days a week the service is used. Fees are billed monthly and are based on the actual number of days your child rides per week. 7:20 a.m.: second pickup point, at the Foothill College VTA stop nearest the main campus entrance. 7:35 a.m.: arrival at the Blackford campus. Lower school students remain on the bus and should arrive at Bucknall by 7:50 a.m. Upper school students transfer to an intercampus shuttle and arrive on that campus by 7:50 a.m.
5:15, 5:30, 5:40 p.m.: afternoon bus service departs from the Bucknall, Blackford and Saratoga campuses. 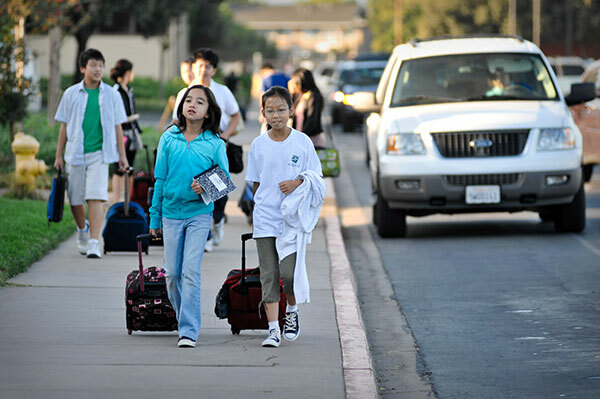 Arrival time at Lincoln Park, 199 University Avenue, Los Altos, 94022, is 5:55 p.m.
Harker's student bus service includes pickup of middle and upper school students at the Santa Clara Caltrain station. A van will meet the northbound train at 7:24 a.m. and the southbound train at 7:36 a.m., then transport students to the upper school campus and then to the middle school campus. The afternoon schedule will be determined as ridership needs are assessed. 6:55 a.m.: pickup at 478 Piercy Road. 7:43 a.m.: arrival at the Blackford campus. Lower school students will be escorted and transferred to the intercampus shuttle for arrival there at 8:05 a.m. Upper school students will transfer to an intercampus shuttle and arrive at the upper school by 7:50 a.m. There is no afternoon return service from Harker to Silver Creek. 7:05 a.m.: pickup at James Leitch Elementary School, 47100 Fernald Avenue, Fremont, 94539. 7:35 a.m.: arrival at the Saratoga campus. Students traveling to Blackford or Bucknall will remain on the bus for their transport to those campuses, arriving Blackford at 7:49 a.m. and Bucknall at 8:05 a.m.
4:40, 4:50, 5:15 p.m. afternoon bus service departs from Saratoga, Blackford and Bucknall campuses. Arrival time at James Leitch Elementary School is 6:15 p.m. Through our intranet we facilitate a carpooling program among families to help them find a good carpooling match. In addition, Harker partners with Zum, a ride-sharing service that serves school families in the greater Bay Area. We provide student parking for our upper school students in a space-available program, with seniors earning first priority.